As anticipated, Apple introduced its next-generation iPad at a launch event in San Francisco. The 9.7" tablet has a faster A5X processor, 4G LTE, 5MP digicam, and a Retina screen with 2048 x 1536 pixel resolution. 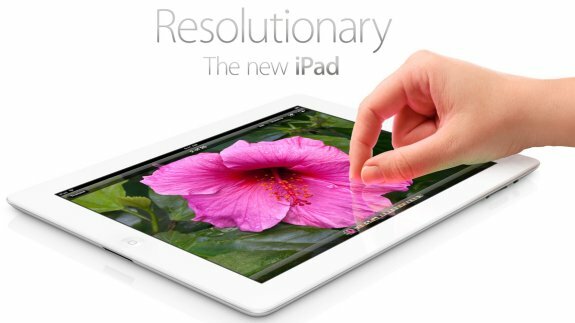 Interestingly, the name of the new tablet isn't "iPad 3" but "the new iPad". Apple® today introduced the new iPad®, the third generation of its category defining mobile device, featuring a stunning new Retina™ display, Apple’s new A5X chip with quad-core graphics and a 5 megapixel iSight® camera with advanced optics for capturing amazing photos and 1080p HD video. iPad with Wi-Fi + 4G connects to fast networks worldwide, including AT&T’s and Verizon’s 4G LTE networks, and still delivers the same all-day 10 hour battery life* while remaining amazingly thin and light. Beginning today, iPad 2 will be offered at an even more affordable price starting at just $399.